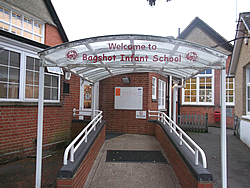 Bagshot Infant School is a warm and friendly school within the heart of the Bagshot community. The original building was built in 1870 and is a beautiful traditional village school with a special needs support centre. We have an active Sure Start Children’s Centre located within the school grounds, which provides access to advice, specialist services and support for families with children under 5. We pride ourselves on our welcoming ethos and the relationships which we develop within the school and the local community. Our school is steeped in history and tradition and we believe this gives our children a great environment in which to learn about their role in the local community and the wider world. The needs of our children drive everything we do and our overall aim is for them to become independent, enthusiastic learners and thinkers who have the confidence to enjoy new experiences and leave us as well developed individuals. This is reinforced by our mission statement Educate, Enable, Enrich and Enjoy, and our core values influence everything we do. In this section, we introduce our staff and our governors. You can also find some of our key, most requested policies, find out how we spend our Pupil Premium funding Welcome from the Headteacher and understand how to apply to join us as well.